I finally got to meet this little guy this afternoon (and I didn't want to post without a picture!). He is SO adorable and has that amazing new baby smell. Kell looks great and is such a proud mamma!! Her husband, Matt is just beaming too. It was SO nice to see the little family together after such a long wait. I know Kell is SO excited for you all to meet him! Hi everyone! One quick post before you will be seeing picture of Kell's sweet babe! That's right...today is the day (I think). I am saying I think because they planned to break her water this morning at 8am but there were no birthing rooms available so she is on hold until this afternoon! (FYI...Kell is standing beside me at this exact moment and she said they are calling her at 3PM to tell her more!) Honestly, that baby is TOO comfortable in there for sure! Ella Minnow Pea (King Street)- OK...if you are looking for GREAT toys, this is THE store for you. She carries toys made of recycled products, wooden toys, vintage toys and even some adorable clothing. Barrypatch Collectables (King Street)- If you have a pottery lover on your Christmas list, Barb has probably the best collection of local potters. There are also great dips to go along with your pottery pieces. Eve Chocolatier (King Street) - As mentioned, Pauline specializes in handmade chocolate truffles and other unique designs including white chocolate dipped marshmallow snowmen! Sonya Roe Jewellers (King Street) - I just drool every time I walk by Sonya's window....she always has the best windows. She carries a range of jewellery from $20 sterling silver earrings up to diamond rings worth $1000. Hopefully you have been good this year and you can get something from her! Boys N Herd (King Street)- Let Eddie help find the perfect gift for that special guy in your life. Maybe you will even be lucky enough to get a little advice about life from this very knowledgeable man. Smith's Cycle and More (Thames Street) - Looking to buy a bicycle for your child or family member? Todd will not only sell you a great quality product but he will also let you trade in that same bicycle once it has been outgrown. Well, that gives you a good start anyways. Like I said, this is not a complete list of great stores (I could go on and on but I am suppose to be working on invites here and not blogging!). I dare you to look around and see what hidden gems you can find! PS...The Kaiser Craft desk calendars have arrived! They are $16.50 and a great gift idea! As promised, here's a pic of my most recent project. No, that is not a picture of my baby yet, we are still waiting. That is sweet Jules days after she was born. This is a Kaiser Craft desk calendar. Don't you think this would be a great gift idea?!? I already know a couple of people I will be making this for! It has a little storage compartment back behind it where you can store all of the extra months and days... too cute! I just found this paper this week, and fell in love! It's funny that I am still finding new things that Kim ordered this summer and fall... what a nice surprise! It is from the g.c.d. Cosette Collection called "Black on White", and I also used "Fiesta", a paisley pattern from that same collection on the back. The adorable numbers are one of the new Unity sets we just got in called "Number Bouquet", and I used the Heidi Swapp month stamps... fun font eh? Everything was stamped in Brilliance "Graphite Black". You will notice that I mounted the back black layer with a circle shaped clip below so you can easily change the photo. Overall this was a very simple project that would look great with any paper, masculine or feminine! Kim just put an order in late last week for more of these (I wanted to make a sample to see if it was cute project before ordering a bunch), so we should have them in late next week if you are interested. Also, THANK YOU for the nice thoughts, wishes and suggestions! I think I'll just keep on creating until the babe comes... I'm in the mood! This is Kell posting today, so as you've guessed, STILL NO BABY!!! I am anxiously waiting for some sort of feeling to let me know today is the day, but nothin'. Tomorrow I will be one week over due, which I know is nothing compared to some of you! I've heard some pretty wild stories in the past few weeks! The first thing I wanted to share is my belly photo session! Matt and I went to get pregnancy pic's done, and I am SO thrilled! We went to London, to a very talented photographer Cynthia, and here is my absolute favourite picture! I just LOVE the shape of the babe... kinda like a pear in there. You can check out her work at http://www.cynthiamoorephotography.com/, hopefully we'll see some of my pic's on her site someday! I just booked a newborn session for December 1st... I can't wait!!! Ok, so now I need some advice of what to do to get this baby moving. I thought I'd tell you what I have tried in the past week, and then you can tell me what I am missing? - washed the kitchen cupboards inside and out! - made more plans, and had and amazing dinner at Chef's Table to celebrate or 3rd anniversary. - been creating... you'll see the advent calendar I made below, which I have been wanting to make for weeks! - packed and re-packed my hospital waaaaay too many times! - (I think) we finally finalized a girls name... boy has been set for a long time. So my list of things to do before the baby comes has grown and grown as I wait. All I have left on my list is this (to post a baby update) and put batteries in all of the babe's things. Any suggestions of anything I haven't thought of? But good news, if I don't go in this weekend, I will be induced on Tuesday, so hopefully by Wednesday there will definitely be a baby!!! With a clean, organized craft room, I am so inspired to create right now! Like I said above, I made an advent calendar this week. The basic box itself is from Karen Foster, it just comes plain white, and then you get to decorate it however you want! How fun would this be for kids for a Birthday, or Easter, or end of the school year countdown? It's endless all of the things you can countdown! Or why not even a little reward box rather than a countdown? the store if you want to check it out! 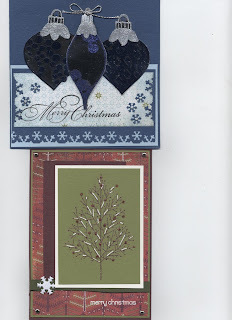 I've used mainly Making Memories "Mistletoe" Christmas paper and embellishments, I love every bit of it! The other three papers I used were Jillibean Soup's "can tomato soup", g.c.d. "snowflake" and My Mind's Eye "under the tree", they all work so great together! To give it some dimension, and to help me open some of the drawers (these swollen fingers weren't fitting in the holes very easily!) I used some Karen Foster sparkle brads and made some ribbon tabs. The numbers seen on here are actually stickers that come with the box. Hopefully tomorrow I will post my project I am currently working on... it is a desk calendar by Kaiser Craft! I am trying to work on projects that will make great Christmas gifts... did you realize it is only 36 days away! Yey, I can't wait! There are still spots available in our upcoming classes. Please see the post below for details and give me a call at the store if you are interested (519.351.5220). Don't miss out! Each class is filled with LOTS of technique. Thank you. Thank you. Thank you. Our Christmas Open House was above and beyond our wildest dreams. You all came out enjoyed our goodies....enjoyed each others company...you picked up some great techniques from Kell and Linda....AND all of this was on one of those beautiful fall days that come around so rarely in November. It was almost TOO perfect in my mind. Thank you again for making it so memorable! I have received a couple of questions about our promotion that we have going on this month. From November 8th to November 28th, we will be giving you a FREE $25 gift card with EVERY $100 spent on product before taxes. Please note that the cost of classes cannot be used in this promotion. This gift card is to be used at a future date BUT does not expire. Stop in and take advantage of this limited time offer! As usual, advanced payment is required to reserve a spot in our classes. You can stop in to pay or call with a credit card number. This MUST be done within 48 hours of reserving your spot or it will be released to the first person on the waiting list. If you cannot make the class after paying, it is your responsibility to find a replacement. PLEASE DO NOT EMAIL OR COMMENT ON THE BLOG TO RESERVE A SPOT. Debbie's cards are going to make you ask, "How'd she do that?" Once again these cards are filled with tons of techniques from embossing, using decorative punches, working with specialty papers and pens, glitter and more. Have a look. These cards speak for themselves. If you haven't designed your cards for this year, you may want to grab one of these ideas! 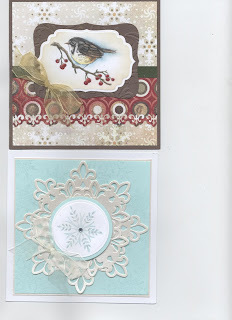 Pauline has created two elegant cards for Christmas. You will work with ribbon, Spellbinders dies, decorative punches, pencils, glitter glossy accents and more. These are two whimsical and cheery Christmas cards sure to make anyone smile. Learn shading techniques using pencils and gamsol, use liquid pearls, ribbon, decorative papers, punches, etc. 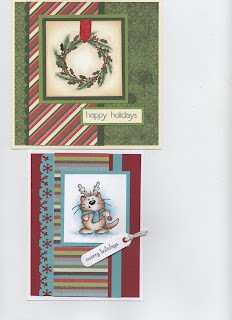 Great class for a beginner or anyone looking to make adorable cards! 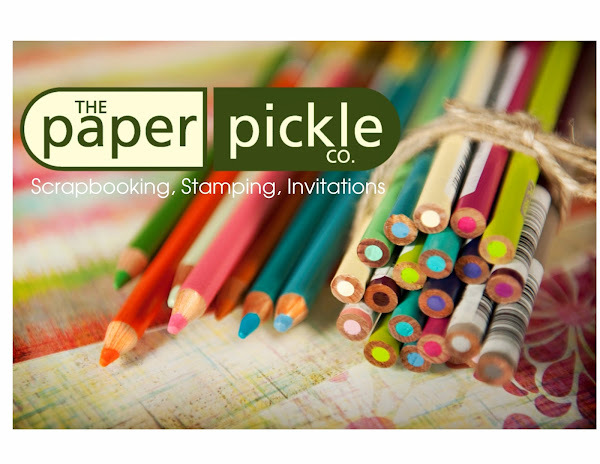 FINALLY, a two 12x12 page layout class that is sure to appeal to both scrapbookers AND stampers. There will be a lot of ink and stamps used in this class but don't be afraid, I will help you every step of the way! The coolest thing that we will be using are Heidi Swapps' masks to create our background...there is no chipboard or stickers here! We will also work with decorative papers, stardust pens, jewels, glitter, embossing, various embellishments and more! Don't forget. 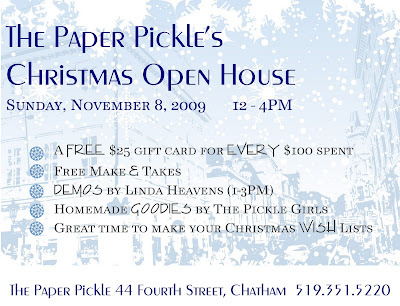 This Sunday, November 8th is our Christmas Open House! We will be open from 12 to 4pm. Well the ribbon jars are filled to the brim. NEW Unity Stamps are in the house! 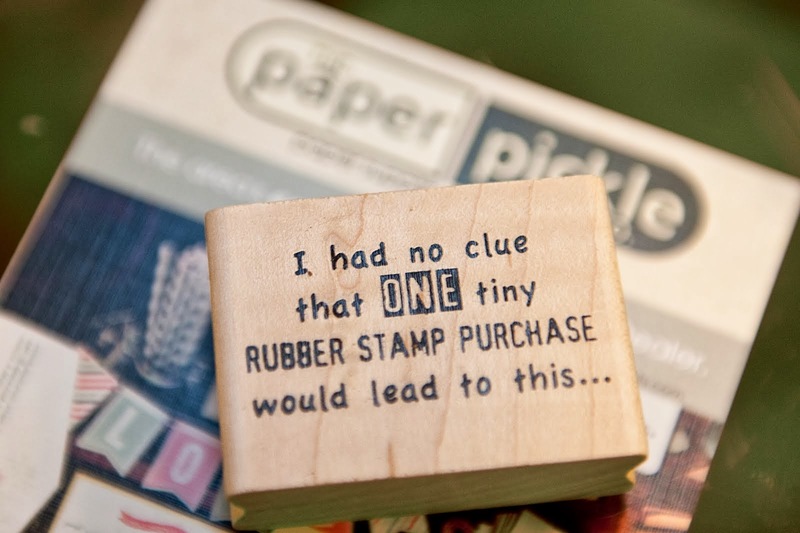 Scrapbookers...you are going to l0vE these! The store is filled with tons of great cardstock and paper. What else have I forgotten? Stop in and see! Oh yes....the goodies update. Well, I think Kell is the peak of her nesting right now (dues date check please....8 days!) We got together to bake but she just keeps baking!!! You are definitely in for a treat!! And if that isn't temptation enough.....we are offering a FREE $25 gift card for every $100 spent before taxes. Hope to see you all on Sunday!! Mark your calendars for NEXT Sunday, November 8th! As it says above, there will be make&takes, demos, goodies and special offers! It truly is a lovely day to visit with fellow paper crafters. Now I know that for some of you Sundays are not the best day for Open Houses, so we have decided to extend the $25 Gift Card offer. So from Sunday, November 8 to Saturday, November 28, we will be giving $25 gift cards for every $100 spent before taxes. That should give you all lots of time to stop in and take advantage of this special offer! !